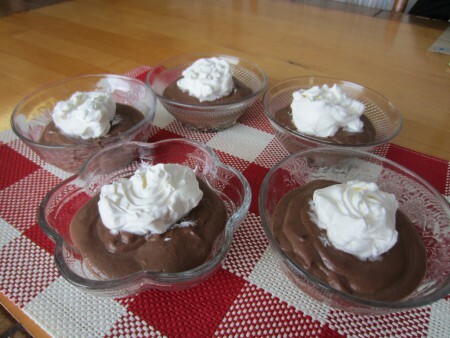 CHOCOLATE PUDDING – for no sugar . . .no dairy . . .and no yeast diet! It’s now almost 2 weeks that Melvin has been on this temporary diet to help get rid of inflammation in his body. At first I wondered what I would make for him to eat every day, especially for dessert! I was determined to provide nutritious foods that omitted sugar, dairy and yeast. Today was another break through for me. I had just taken out a container of unsweetened apple sauce to have on toast. It is always sweet enough without adding any sweetener, so I had an idea. Why don’t I replace the sugar called for in this pudding recipe with applesauce. I got out my COOKING WITHOUT MOM recipe book (as these are smaller quantity recipes & if it didn’t turn out, there would be less to throw out) and worked with the pudding recipe on page 109 by substituting ingredients he couldn’t have. With a hand blender, mix all the above ingredients until very smooth. Add the coconut oil. Heat on medium heat on the stove until thickened, being sure to stir as it heats. If you are heating it in the microwave to thicken, stop it several times to blend it smooth with the hand blender so the end result will be smooth. Pour into fruit dishes, cool and enjoy! Top with a tablespoon of non-dairy whipped topping! A hand blender is a must-have tool for every kitchen. It is so easy to use and simple to wash! But most of all we never have lumpy gravy, pudding or sauce of any kind. I also puree many foods including my homemade ice cream!